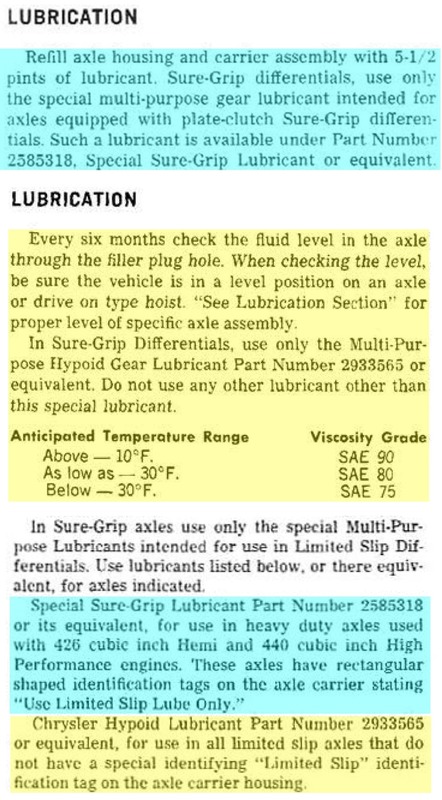 What kinda lubrication oil can I use on my AAR rearend 489 with sure grib? Castrol LS 90(GL 5) ? A good gear oil like you propose with an added limited slip friction modifier. The modifier is needed so the limited slip feature works smoothly. Your parts store will have the friction modifier in a small bottle or tube to add to the oil. I use the Kendall limited slip axle additive concentrate in the 4 OZ bottle. Cone type sure-grips don't require an additive. Cone sure-grips will chatter if you run standard gear oil without the additive. I would guess the "special lubricant" sold by Mopar already had friction modifier added. That may be the case, but it does not use the same lube as a clutch type. Maybe the new additives will work with either sure-grip? I have no personal knowledge. Both those numbers, 2585318 and 2933565 supercede to 4874468 80/90 gear oil. I would use the additive, can't hurt, or can it ? From what I have read, the original "Fish" oil additive was too slippery for the cone type. I don't know how the cone-types work with the currently available additives. DoctorDiff seems to think they are not a problem. Maybe he will chime in with his recommendations? I use standard (Ford/Spicer) type friction modifier additive for cone sure-grips and late model Dana 60 power-locks with fiber plates. I use GM friction modifier additive for 8 3/4" power-locks and early Dana 60 power-locks with steel clutch packs. I found out the hard way by not using the additive in a "cone type" sure grip ! Just curious, what was destroied in the diff after you has used oil without additivs? The sure Grip cones,bearings or pinion? Read this FSB from Hamtramck Historical. That info is 40 years old. A lot has changed since then. I rather go by the experiences of people using the stuff today. I'd have to agree. Even the cone-type didn't use regular gear oil in 1970. I have used just straight gear oil in my 6bbl car for the last 30 years though & it still works great after 100K miles. Since it's a cone rear end & it's lasted this long, I'm sure it's cause I've always babied it! Are you saying the FSB's are worthless because they are 40 years old? How old are you? What has my age got to do with it. Lubricants have changed in the last 40 years and that makes old info dated and not necessarily correct now. I was just giving you a bad time. I was just pointing out that age has very little to with the worthiness of a man or technical information. Sure the information is dated, but so are the parts and problems that are being discussed. If you had read the SB you would have seen that it addressed problems that were encounter in the field and some fixes. The second paragraph has a statement that a special additive was not required and when used, only temporarily resolved some of the symptoms. It did not fix the problem. That FSB is vague and misleading. What are "special additives"? STP, PowerPunch, Slick 50, Lucas additive, Marvel mystery oil...? What is the "recommended lubricant" that can only be used? Sounds like it is NOT standard gear oil. **Note the similar terminology about "other additive and oil types" that should not be used. Maybe this will help clear up the "recommended lubricant".